I'm not being coy-- you know me better than that-- and I wish I could remember her name, but I can't even remember for sure if I heard her on the radio while I was driving or on TV in the next room while I was working. She truly exemplifies everything wrong with unlicensed political punditry. I can't imagine as stupider person talking on politics but apparently she wrote a funny political story in a magazine before the election about something or other that had to do with denigrating Democrats, who she predicted would not win control of the House and how it would be Nancy Pelosi's fault for being so old. What better reason than to invited her onto a show and presented as an expert? The best part is that she knew absolutely nothing at all. Literally nothing. She had a list of wretched Blue Dogs from the far right wing of the Democratic Party, who she, of course, referred to as "centrists," contrasted them with "leftists" like Pelosi. She was so stupid and filled with ignorance that my jaw was agape wondering how the show's producer has a job. She suggested that if Pelosi is reelected speaker, she not be allowed on TV but that instead a team of Blue Dogs (the ones owned by Wall Street and Big PhRMA, Big Oil and the military industrial complex, from the Republican wing of the Democratic Party become the public face of the party and deliver all the messaging). She ran through her puke-inducing list of the worst members of the party: Cheri Bustos, Josh Gottheimer (who has literally voted more frequently with Trump than with his fellow Democrats), Kurt Schrader, Dan Lipinski and...out of the blue, the sordid California wing-nut pretending to be a Democrat, Jim Costa. Let me go off on a slight tangent. The Democrats had an opportunity this cycle to take out a real Republican arch-villain, Devin Nunes in California's Central Valley. But I knew it wouldn't happen even before the race got going. The political establishment got behind a Republican-light candidate giving voters in the district a choice between a real Republican and a Republicanish mush of a candidate. His name is Andrew Janz and he raised an incredible $8,252,310-- none iff it because of him, 100% of it because of his opponent. But even with that kind of money, I knew he had no chance. (FiveThirtyEight have him a 1 in 20 shot at winning-- 4.6%; a bad bet for over $8 million.) In the end, Nunes did worse than he should have against so weak a candidate as Janz-- 106,240 (53.5%) to 92,462 (46.5%). Janz had two things going for him: Trump and Nunes. But that's it. You could have hardly have found a worse candidate to run as a Democrat. A few days after he announced-- and before his fancy consultants polished him up a little-- we spoke on the phone. After professing ignorance about what single payer (and then Medicare-For-All) meant, he volunteered to tell me what his two motivations were for running. I was all ears. Increasing the use of the death penalty and protecting the Second Amendment is what he told me. While I was recovering my composure, I tossed him a soft-ball. Are there any members of Congress he especially admires and would like to work with. He didn't miss a beat: Jim Costa. So who's Jim Costa, this member of Congress that both the worst candidate of 2018 and the stupidest pundit I ever heard, both spoke so highly of? Like Nunes, Costa is the grandchild of Portuguese immigrants who went into dairy farming. He was elected to the state Assembly in 1978, where he was widely considered the worst and most right-wing Democrat in the legislator. When he was finally term-limited out in 2002 he became a corporate lobbyist. 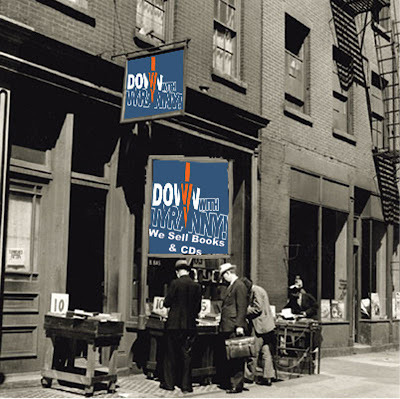 But then his local New Dem congressman, Cal Dooley retired 2 years later to become a K Street lobbyist himself. Costa-- despite an arrest for hiring teenage hookers-- one of whom was an undercover cop-- and despite drug paraphernalia found in his home, won the primary. Costa's congressional district, CA-16, includes most of the city of Fresno, all of Merced County and a piece of Madera County. Aside from Fresno, the population centers are Merced, Madera, Chowchilla and Los Banos. Less than 25% of the population is white. The PVI is D+9 and the last 3 presidential elections were won by Obama (twice) and Hillary with around 58% of the vote. 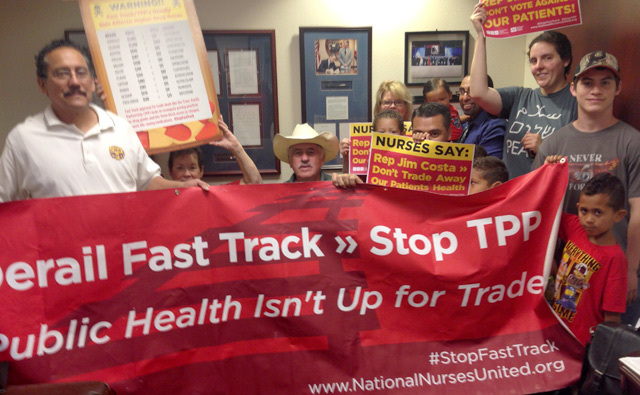 Costa, who engenders zero enthusiasm among Democratic base voters, has been on shakier ground. In 2010, Republican Andy Vidak's challenge was so strong that, despite Costa outspending him $2,076,986 to $891,826, it took 3 weeks of recounts before Costa was declared the winner by 3,050 votes. 2014 was even worse for Costa. With no help from the GOP whatsoever, dairyman Johnny Tacherra-- outspent by Costa $1,116,677 to $342,204-- Tacherra was declared the winner on election night. A shady recount in Fresno handed the final tally to Costa 46,277 (50.7%) to 44,943 (49.3%). Costa's foolish and dysfunctional response to these close callas has been to tack further and further right. In the current cycle his overall "F" rating from ProgressivePunch was underpinned with a abysmal 36.36% score, worse than 2 conservative Republicans and the 3rd worst among House Dems after fellow Blue Dogs Kyrsten Sinema and Henry Cuellar. His lifetime crucial vote score is 42.94, the 6th worst in the House. His Trump affinity score is 47.1% one of the worst of any Democrats', having voted, for example, to support ICE, to roll back Dodd Frank protections, to allow guns in schools, to allow for racial profiling by auto finance companies, against opening impeachment hearings (twice), reauthorizing warrantless wiretapping of American citizens under FISA, for attempts to repeal Obamacare, removing antitrust exemption for insurance companies, for Trump's scheme to hobble regulatory agencies, for repealing a rule requiring energy companies to reduce waste and emissions, and against Climate Change efforts involving ozone standards-- and that was just in the last two years! Whenever there are Democrats crossing the aisle to support the GOP, you can always expect Costa to be among them. 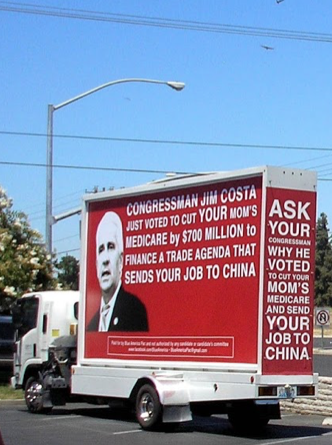 After he voted for the TPP (which included $700 million in cuts to Medicare), Blue America sent our lovely accountability truck (below) to drive around Modesto, Merced, Atwater, Livingston and Fresno, you know, to spend a couple of weeks reminding voters in the district what Congressman Costa is all about. 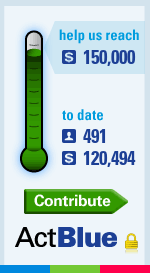 Blue America pays for operations like that-- whether in election years or not through our grassroots fueled Independent Expenditure Committee, which you can contribute to by clicking on the thermometer above. The voice of the Democratic Party? The one in charge of messaging? Should the lady pundit advocating that really be introduced as an "expert" without any context whatsoever? She didn't even both to mention that Costa is chairman of the Blue Dogs! the democrap PARTY in microcosm. Not all democraps are that overtly bad, but the money still drives their every action. Most democraps ARE a little more circumspect about their corruption, rhetorically. But not in their deeds. I approve of this new series topic, Howie. It also might be a good idea as things move ahead to keep an eye on the votes of these lying losers for consumption in the run-up to the next primary. Now if only we had enough good candidates to replace these corporatists. I heard the same segment on NPR driving home Friday. She starts off admitting she was wrong about Pelosi dragging down Dem candidates, makes the potentially good point about introducing a new generation of leaders, and then names all those bad Dems.... I was flabbergasted. Looking forward to the series & thanks for the work you do digging into both the current reps and potential candidates.